Usually when you think NASA you conjure up images of Mars and space stations. But the agency also conducts important climate research. 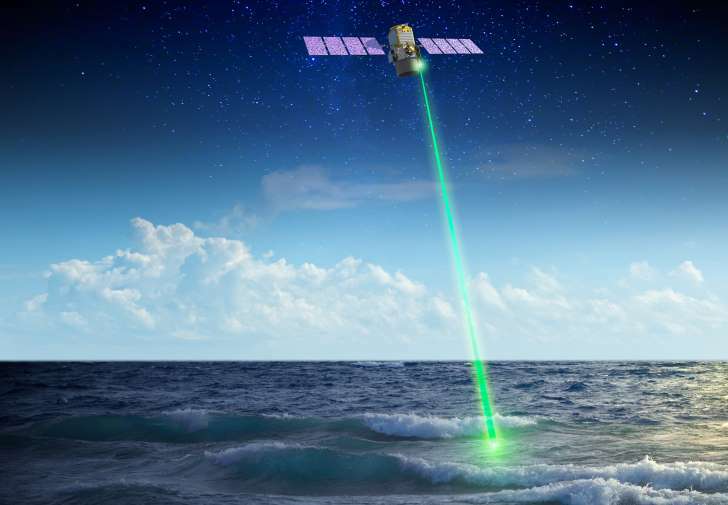 One of those projects is the Cloud-Aerosol LIdar with Orthogonal Polarization (CALIOP) aboard the Cloud-Aerosol Lidar and Infrared Pathfinder Satellite Observation (CALIPSO) satellite that measures plankton levels through clouds. Previously, NASA could only measure plankton levels from satellites when it could see the reflection of the sun on the ocean. But the Lidar-based system doesn't rely on outside light sources to see the amount of sea plants. Instead it can see vegetation day or night and even through some light clouds. "CALIOP was a game-changer in our thinking about ocean remote sensing from space. We were able to study the workings of the high-latitude ocean ecosystem during times of year when we were previously completely blind." said Chris Hostetler, a Langley research scientist. The researchers have been able to study the variations in plankton with CALIOP since 2006. "The take home message is that if we want to understand the biological food web and production of the polar systems as a whole, we have to focus both on changes in ice cover and changes in the ecosystems that regulate this delicate balance between predators and prey," said Michael Behrenfeld, a marine plankton expert at Oregon State University in Corvallis. A giant laser in the sky is helping us better understand our oceans. It’s known as the Cloud-Aerosol Lidar with Orthogonal Polarization (CALIOP), and it’s a NASA instrument housed aboard the Cloud-Aerosol Lidar and Infrared Pathfinder Satellite Observation (CALIPSO) satellite launched a decade ago in 2006. Using a laser, the CALIOP has been helping scientists monitor plankton in polar regions for the last nine years. Before the CALIOP era, the space agency was only able to keep tabs on plankton levels when the sun was cooperating. But because the Lidar-based system doesn’t actually need sunlight or any other external light source to monitor plankton, it’s capable of collecting data at all times of the day and night, and through different weather conditions, too. And now, NASA scientists have made a new discovery regarding plankton, specifically that “small, environmental changes in polar food webs significantly influence the boom-and-bust, or peak and decline, cycles of phytoplankton.” This, the space agency team says, could be instrumental in helping humans better understand the interactions between Earth’s climate and key ocean ecosystems. “It’s really important for us to understand what controls these boom-and-bust cycles, and how they might change in the future so we can better evaluate the implications on all other parts of the food web,” said Michael Behrenfeld, a marine plankton expert at Oregon State University in Corvallis. 2016 has been a bountiful year for space science. Before the calendar runs out, here's our list of the biggest space stories and events of the past 12 months. There were monumental new discoveries, including the first-ever direct detection of gravitational waves, which gives scientists access to a whole new realm of information about cosmic events. This year, scientists also discovered a potentially habitable planet orbiting the star nearest to Earth's sun. As always, there were also hurdles and setbacks. The ExoMars mission sent both an orbiter and a lander to the Red Planet, but the lander crashed into the planet's surface before it could begin its science mission. And multiple studies searching for signs of a particle that could explain mysterious dark matter turned up empty. As the year winds down, 2016 also leaves us with some tantalizing possibilities for 2017, like the potential observation of a ninth planet beyond Pluto orbiting our sun. But before we look ahead, let's look back. Here are the biggest and best space science stories of 2016. In February, the Laser Interferometer Gravitational Wave Observatory (LIGO) collaboration made physics history when it announced the first direct detection of gravitational waves — ripples that stretch and compress space itself. Albert Einstein showed that space and time are fundamentally linked, so gravitational waves actually pass through the cosmic fabric known as space-time. The direct detection of gravitational waves opens up an entirely new realm for astronomy because these waves carry information about the objects and events that create them, and this information is not conveyed by any other means. Right now, scientists can study the universe by collecting light from distant objects (and, in some cases, other kinds of particles), but gravitational waves are not created by the same mechanisms that create light. LIGO made two gravitational-wave detections this year (the second was announced in June), and in both instances, the waves came from two black holes swirling around each other and colliding. Those mergers would have been invisible to astronomers were it not for gravitational waves. As LIGO continues to study the sky, scientists are eager to see what other cosmic treasures it uncovers. The star Proxima Centauri lies just 4.2 light-years from Earth's sun — a stone's throw, cosmologically speaking. In August, scientists discovered a planet orbiting in Proxima Centauri's habitable zone, or the region where liquid water might exist on the planet's surface (and thus boosting the odds that life might have evolved there). This newly discovered planet, dubbed Proxima b, has a minimum mass of about 1.27 times Earth's mass, further increasing the possibility that this planet could be habitable. Shortly after the discovery was announced, a group called Project Blue started fundraising to build a space telescope with the targeted mission of studying Proxima b and looking for signs of life there. In April, the Breakthrough Foundation — whose board members include physicist Stephen Hawking, Facebook founder Mark Zuckerberg and entrepreneur Yuri Milner — announced an initiative called Breakthrough Starshot, which will aim to send a microchip-size spacecraft to another star. With the discovery of Proxima b, the Starshot project organizers announced that they would target this newfound planet, and potentially search for signs of life. The spacecraft would be accelerated with a massive (and expensive) laser system, and would still take about 20 to 25 years to reach Proxima b. A massive ice deposit spanning a region the size of New Mexico was discovered in Mars' mid-northern latitudes. The deposit lies between 3 and 33 feet (1 to 10 meters) below the Red Planet's surface, it's between 50 and 85 percent water (the rest is dirt), and its total volume is about the same as that of Lake Superior, which holds about 2,900 cubic miles (12,100 cubic kilometers) of water. The ice deposit could be useful if humans eventually settle on Mars. The region where the deposit was found, called Utopia Planitia, could be easily accessible by spacecraft because it is relatively flat and low-lying. The ice deposit was discovered using the Shallow Radar (SHARAD) instrument aboard the Mars Reconnaissance Orbiter. The Hubble Space Telescope has spied what appear to be plumes of water erupting from the surface of Jupiter's moon Europa. This icy satellite may harbor a liquid water ocean deep below its surface, and scientists think that ocean could have the right ingredients for life. NASA is currently planning to send an orbiting probe to study Europa in the 2020s. If Europa is indeed spewing water from its ocean into space, that opens up the door for an orbiting mission to sample the water (without having to drill into the ice or even land) and look for hints of biology there. The Hubble telescope had spotted a plume erupting from Europa in 2012, but that detection seemed like it might have been a rare outlier, because no plume activity was observed in the intervening years. Four studies released this year came up empty in a search for a particle that could possibly compose the mysterious substance known as dark matter. Although dark matter does not radiate, reflect or block light (and is thus invisible in the traditional sense), dark matter's gravity can bend light, giving scientists the opportunity to detect it. There are various other bits of evidence that indicate dark matter not only exists but is five times more common in the universe than "regular" matter (the stuff that makes up stars, planets and people). The first study came from the incredibly sensitive Large Underground Xenon dark matter experiment, which failed to detect signs of a hypothetical particle called a weakly interacting massive particle (WIMP). The negative results don't rule out WIMPs, but they do put new restraints on the potential characteristics of a WIMP dark matter particle. Two additional searches for WIMPs were conducted using data from the Fermi Gamma-ray Space Telescope, which collects high-energy particles from the universe. Those searches also came up empty. A final study looked for signs of another hypothetical particle, called an axion, using Fermi data from one particular galaxy, but it turned up no such evidence. In 2011 and 2013, a distant star known as KIC 8462852 (also known as Tabby's Star) appeared to dip in brightness as seen from Earth. This kind of brightness change can occur when an object such as a planet passes in front of a star, but planets orbit their parent stars on a regular time loop, and the changes in brightness coming from Tabby's Star were highly irregular. In 2015, a hypothesis emerged that captured the public imagination: Maybe an alien civilization had built some kind of megastructure around Tabby's Star, periodically blocking the star's light as seen from Earth. Alternative explanations (all of which seem far more likely) were produced, but there's not enough evidence to fully explain the mystery. In 2016, the saga of Tabby's Star continued. New evidence suggested that the star's sporadic dimming might have been going on for a century. That makes it unlikely that the source of the dimming is a swarm of comets, but it could also make it unlikely that an alien megastructure is to blame. Further observations revealed that the star not only demonstrated periods of rapid brightening but was apparently decreasing in brightness overall. That hasn't discouraged people from investigating the star further. The Breakthrough Listen initiative, which will spend $100 million over the next 10 years to hunt for signals possibly produced by alien civilizations, plans to study Tabby's Star with the 330-foot-wide (100 m) Green Bank Telescope in West Virginia. Astronomer Tabetha "Tabby" Boyajian of Yale University (for whom the star is nicknamed) was part of the team that originally identified the star's irregular behavior. Boyajian and her colleagues collected more than $100,000 through a Kickstarter crowdfunding campaign, and they plan to use those funds to pay for telescope time to study Tabby's Star further. Dwarf planet Makemake has its own moon! The dwarf planet known as Makemake lies even farther out in the cold reaches of the Kuiper Belt than Pluto, at about 45 times the distance between the Earth and the sun. But it's not alone out there: Earlier this year, scientists using the Hubble Space Telescope discovered a small moon orbiting Makemake (pronounced MAH-kay-MAH-kay). This miniature companion is thought to be about 100 miles (160 km) wide. (Makemake itself is about 870 miles, or 1,400 km, wide — or a little more than half the diameter of Earth's moon.) Scientists will watch the orbital dynamics of Makemake and its moon to learn more about the dwarf planet, including its density. In addition to the above science results, 2016 gave ys some tantalizing hints about new science we can expect to hear about in 2017 and the years ahead. NASA's Juno spacecraft arrived at Jupiter on July 4, and settled into its unique orbit with the giant planet. The plan was to have Juno make a close approach of Jupiter every two weeks, but a thruster problem forced the probe to stay in a longer orbit and instead make a close approach of Jupiter every 53 days. Even though no major science results have been produced by the Juno science team yet, the JunoCam instrument has been sending back stunning images of the Jovian giant, providing an unprecedented look at this gaseous monster. Juno principal investigator Scott Bolton said the images are already providing tantalizing hints about the science that Juno will produce. The ExoMars mission, a collaboration between the European Space Agency and Russia's Roscosmos, was designed with two parts: an orbiting satellite and a surface lander. But the lander met an early end when the landing technology malfunctioned, causing the probe to crash into the Martian surface. But the orbiter remains operational, and it's gathering information that will help inform the next phase of the ExoMars project: sending a rover to the Martian surface. The rover will include a drill that will dig to depths of up to 6.5 feet (2 m) into Mars' dirt and soil. In September, SpaceX founder and CEO Elon Musk delivered a long-awaited speech outlining the company's plans to eventually build human colonies on Mars. But before SpaceX starts sending humans to the Red Planet, it could help serve various science objectives, such as returning dirt samples collected by NASA's Mars 2020 rover (scheduled to launch in 2020). In April, Musk announced on Twitter that the company plans to send uncrewed landers to the surface of Mars as early as 2018. Although NASA will offer technical support for SpaceX's first missions to the Red Planet, the agency announced this month that it will not send science equipment on the very first SpaceX missions. Instead, the agency will wait until SpaceX has proved out the technology. Early this year, a group of scientists announced that they had found significant evidence to suggest that there is a planet the size of Neptune beyond Pluto, orbiting our sun. The so-called Planet Nine hasn't been observed directly yet, but the movement of other bodies in that outer part of the solar system indicates the presence of a massive body, the researchers said. The group, led by Mike Brown of the California Institute of Technology, produced more evidence later in the year, as they looked at more data tracking the precise motion of small bodies in the Kuiper Belt (the region of the solar system beyond Neptune that is filled with small, rocky, icy bodies). Theories have also emerged about where the planet came from and how it arrived at its distant — and likely very tilted — orbit around the sun. The authors of the paper also have proposed ways that the planet could be spotted by modern telescopes, as well as the general region where they say the planet should be orbiting. Perhaps 2017 will be the year Planet Nine is found. 0 Response to "NASA uses space laser to study polar ocean plants"